What Is A Batch Feed Garbage Disposal? Based on how food wastes are added garbage disposals can be divided into two types; Batch Feed type and Continuous Feed type. For a batch feed type garbage disposal, the food wastes are added in batches whereas for a continuous feed one the wastes are fed continuously while operating the machine. How Does A Batch Feed Garbage Disposal Work? Batch feed disposal is suitable for small households which do not produce much food wastes at a time. The wastes are thrown down the disposal as per convenience and are stored there till it is filled up. Once it is full its top cover is closed and the disposer is turned on. For this type of disposals, it is not possible to add any more wastes while it is ON. Once grinding is complete you can remove the top cover and add the next batch of food wastes. This batch wise feeding is the reason why they are called batch feed type disposals. When I first started this website there weren’t many batch feed disposals in the market. But today there are lots of them. It is true that they are not as popular as continuous feed type ones but owing to the string competition all brands are coming up with new products and new features. 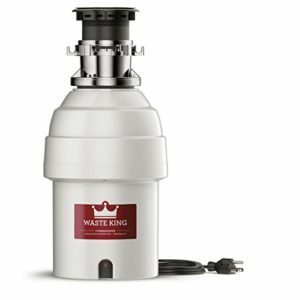 So I made a list of the best batch feed garbage disposals and updating this old post with their review. This is the only batch feed garbage disposal I included on this website for a long time. When I was looking for making a list of the 10 best garbage disposals this was the only one good enough to be considered. And still, this is the best batch feed garbage disposal. InSinkErator Evolution Essential is a premium product with premium features. It has SoundSeal technology which makes this disposal is one of the quietest among all others. It uses multi-grinding technology; the food wastes you add into it undergo two-stages of grinding. Its ¾ HP motor is more than enough to dispose of all household wastes, combined with the multi-stage grinding system this disposer can handle most tough foods. Its grinding components are all made of stainless steel which is much more durable and long-lasting than other materials. It also comes with a 6-year warranty. Don’t forget to check this complete review of InSinkErator Evolution Excel before buying. The L-5000TC is powered by a 3/4HP permanent magnet motor. It is a high-speed motor that runs at 2700 RPM. This high speed enables to it grind food wastes faster. The L-5000TC batch feed disposal uses EZ mount system which is easier to install than one with a 3-bolt system. This also allows you to remove the splash guard for cleaning its underside. All grinding components of L-5000TC are made of Stainless Steel, its grinding chamber is made of corrosion proof glass filled polyester. The build of the disposal is high quality which is a good reason why it comes under a 10-year warranty. It also has decent noise insulation though not as good as the Evolution Essential. But it is priced way much lower, you get almost the same performance at a lower price (and a power cord too). This batch feed disposal is more powerful than the 5000TC reviewed above. It is powered by a 1HP motor that runs at 2800RPM. It shares lots of its features with 5000TC, like noise insulation, EZ mount installation, stainless steel grinding components, corrosion proof grinding chamber, and even the warranty is the same 10 years. The difference they have is in their motor power, as mentioned above and size, the L-8000TC is bigger in height than the other. While size or chamber capacity doesn’t mean much for a continuous feed disposal it matters for a batch feed one. A bigger chamber means you can add more food wastes at a time. If you are looking for a bigger and powerful disposal go for the 8000TC else save a few bucks with 5000TC. “..ideal solution for stringy foods such as corn husks and celery..”that got my attention. I included a list of items that you shouldn’t put in a garbage disposal, and if you check celery and corn husks are on that list (it’s a printable list so feel free to share). Yet, KitchenAid is confident that their disposal can grind them without jamming. 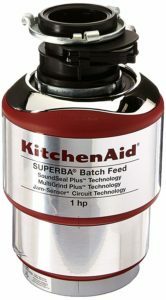 This may be true because this is the most feature-rich disposal I have seen from KitchenAid (check other KitchenAid disposal reviews). It is powered by a 1HP motor and has an RPM of 1725, yes this is a slow speed disposal when compared to many others especially Waste King products but a lower RPM means more cutting torque. It comes with SoundSeal technology, a three-stage grinding system and an anti-jamming sensor circuit. The only other disposer I have seen with a 3-stage grinding and Anti-jamming sensor is InSinkErator Evolution Excel. Its build quality is also excellent. The stainless steel grinding components last long. And its grinding chamber is also made of stainless steel just like InSinkErator Evolution Essential reviewed first here. It comes with a warranty of 7-years. Which Is The Quietest Batch Feed Garbage Disposal? The quietest among batch feed disposals is InSinkErator Evolution Essential. It uses a technology called SoundSeal which seals most of the sound from getting out. This is achieved by adding super insulation around the motor and also by preventing vibrations of any parts of the disposals. This is crucial since even tiny vibrations can make noise since they are all made of metal. See some other stainless steel disposals here. 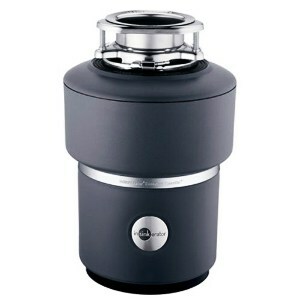 A batch feed type garbage disposal will work only if its top cover is closed. This means that it is impossible for any foreign objects to get into the disposal, and this completely eliminates the possibility of you sticking your hand into the disposal. This also prevents any damage caused to the impellers by accidental dropping of any kitchen utensils. Since batch feed type disposals are operated only when they are filled up this eliminates the frequent use of the machine. Less use means fewer energy charges. It will be time-consuming using a batch feed type disposal for processing large quantities of food, you will have to wait till one batch is complete to add the next one. As compared to the batch feed type disposer, continuous feed type disposers are way too popular considering the sales graph. 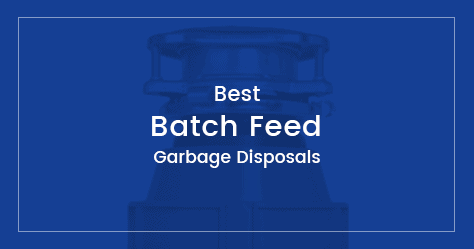 So naturally, there aren’t many models available for batch feed type disposals. Although Batch type garbage disposers are not as popular as the other type they are great if you don’t have large quantities of food wastes to dispose of every day. Which is the quietest garbage disposal? 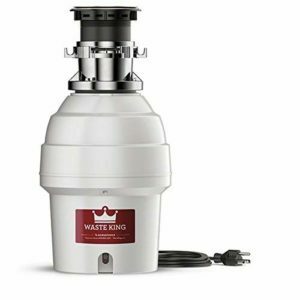 Waste King vs InSinkerator – which is the best brand? How much is a garbage disposal?